The Little Heath Works was opened in 1926 – the factory complex manufactured textile products. The site was originally owned by Courtaulds and subsequently by Acordis Acetate. The works were closed in 2007 and underwent demolition to slab level in 2010. 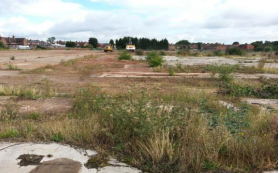 The 40 acre site in Coventry is being developed for both residential and commercial use. Planning permission has been granted by Coventry City Council for the development of 344 new homes with ten acres being reserved for ‘Employment Land’. Trebor Developments [TD] are developing the ‘Employment Land’ area of the site for subsequent occupation by Lex Autolease. Baynham Meikle Partnership [BMP] and Anglo Holt have been engaged by TB as the design consultants and the main contractor respectively. WSP had previously carried out a site investigation which identified the presence of chrysotile asbestos and hydrocarbon contamination. The identified asbestos contamination was not present in concentrations >0.1% and therefore not considered to be hazardous. The identified hydrocarbon contamination comprised of benzo(a)pyrene in isolated pockets in surface soils and solvent contamination in groundwater – the hydrocarbon contamination was not considered to pose a significant risk to human health (as the site is being developed for commercial use with hardstanding across the majority of the site) or controlled waters. WSP therefore concluded that remediation was not necessary based on the site investigations and supporting risk assessments. Envirotreat was commissioned by BMP on behalf of TB to provide specialist services in relation to potential land contamination on the site and to address associated planning requirements.